If you're an ocean fishing expert...you can quit reading now. OK, for the rest of us -- especially those of us in So Cal or planning a vacation here -- let's talk ocean sportfishing. Say you've always wanted to fish, but after listening to old-timers boast about landing the "big one," you’ve thought twice. Don’t worry. They don’t call them "fish tales" for nothing. Sure, reeling in a 200-pound yellowfin takes talent. And biceps. But everyone learned sometime, and if you ask the captain of any ocean fishing boat he or she will tell you: a significant portion of business comes from beginners. In fact most captains and crews love to get out on the water with first-timers. Captain Joe Cacciola of the Sea Star out of Oceanside says nothing beats seeing the thrill on someone's face when they catch their first fish. Joe says beginners make ocean fishing worthwhile. His business -- 35 years in fishing charters, 25 years as captain of his own boat -- is really about spreading his passion for the sea. "If I can share what I’ve grown to love, it’s a great thing," he says. He sat down with us for an afternoon to talk fish, boats and the ocean with beginners in mind. He answered questions across the spectrum of what makes ocean fishing so much fun off Southern California. Where are all the harbors? The first thing visitors should keep in mind, he says, is that unlike other parts of the country with abundant natural bays, California is long on coastline but short on ports. Almost the entire coast is public land, but boat entry points are limited to harbors (mostly man-made) at best about every 20 miles. People should remember that, Joe says. If someone is staying in Del Mar they’re not going to be able to go ocean fishing from Del Mar. 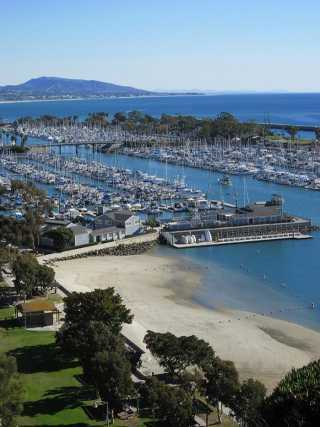 But the harbors in Mission Bay, San Diego, Oceanside and Dana Point (left) are just a short drive away. Get yourself a fishing license and then do a little research, Joe says. Find out where the closest ports are and where the sportfishing landings are at those ports (a "landing" is the place in a harbor that loads and unloads boats). Give the landings a call, he says. Check out Web sites and newspaper listings that provide daily reports on what's biting. But most important, Joe says, if you've got the time, go down to the landing you're considering -- late afternoon is best, when the boats are just coming back -- and chat. "If the boat's well-maintained and the crew is well-groomed and friendly you're probably going to have a good time with them," he says. The crew can not only tell you, but also show you what their passengers caught that day, which might be a good indication of what will be biting the next day. What type of boat to look for depends on your needs. Charter boats -- boats that can be hired for private parties -- range in size and capacity. "Six packs," no matter their size, are boats that take no more than six-passengers. Some charters take larger groups and can reach 75 feet long. Joe's Sea Star is a 60-foot boat and can take anywhere up to 40 people. Bigger doesn't mean more expensive. Accommodations, gear, personal attention, galley service, all vary from boat to boat. And even if a trip's price sounds expensive, it might not be so when split between the members of your group. Besides charter boats, visitors can sign up for open party boats. These regularly scheduled, pre-packaged trips run anywhere from a half-day, three-quarters of a day to multiple days. They're typically less expensive than charter boats but also typically have more people. The advantage for beginners is often the lower cost. The disadvantage is that more people means less assistance from the crew. Either way, it pays to shop around and find what suits you best, Joe says. Most ocean fishing landings in Southern California offer both charters and open party trips. Check with each landing to find out details. What fish live off Southern California? OK, so you've picked your boat, you're heading out on to the water, what fish can you expect? Southern California's climate may be temperate year-round, but the waters definitely have their seasons: a low of around 55 degrees in winter to a high of about 75 degrees in summer. Most of the region's fish hang around all year. But months with warmer water (May through October) bring more migratory fish such as bonito, tuna, yellowtail and baracuda and in colder months those fish often head south. Day trips, stay close to shore or close to the islands, and beside the migratory fish, you might also catch fish native year-round to Southern California waters: bass, whitefish, sheephead, sculpin, mackerel, cabezon and halibut. Your captain might also take you where rock fish are biting, and in colder months boats often have more luck with these varieties, meaning you could bring some rock cod home for dinner. For longer trips, Joe says he'll take the Sea Star to the sea mounts far offshore that attract pelagic (migratory, open-ocean) "big game" fish such as albacore, mahi mahi (locally called "dorado "), sometimes marlin, even sharks. What about equipment and skills? If your image of ocean fishing is Ernest Hemingway hooking marlin from a fighting chair, Captain Joe says think again. Most trips are about much lighter fishing, with a lighter rod and tackle. They often rely on live bait -- sardines or anchovies -- thrown overboard in what's called "chumming" to attract game fish. The technique's common in Southern California but not elsewhere. Joe says that from the late nineteenth century on, when American boats first started fishing off Southern California, fishermen noticed live bait was what fish here responded to -- and they still do. Using live bait has its challenges. Some people argue that chumming is counter-intuitive because it attracts more fish. But Joe says more bait makes fish choosy, and catching them becomes an art: Anglers must develop nuanced skills to make their bait look natural next to the real thing. "You have to drop to a lighter line, down 10 to 15 pounds just to get them to bite," he says. "When you drop to the lighter line, you can't put as much pressure on that fish, so it becomes much more challenging." That’s when he says being on a charter might be an advantage to ocean fishing newcomers. A smaller boat often has more crew available to help out and give advice when someone gets a bite. Boats also typically have gear to rent -- which not only is useful for beginners, but Joe points out that crews know what equipment is best for what's biting that day. Who goes on out the Sea Star? Joe says that’s changed dramatically in his 35 years as a captain. Forget clichés of a beer-swilling "guy thing." Those days are long gone, thanks to social stigma and laws against drinking and driving. Plus captains no longer tolerate that behavior due to potential liability. But like any business, ocean fishing boats follow the market. As interest from women has grown -- often 20 percent of passengers -- and people want to teach their children to fish, even old-timers have become more conscious of their behavior, Joe says, and the sport has become family-oriented. "I go out of my way to make sure that the kids I have on my boat catch something and have a positive experience," he says. "Because that's the future." That harks back to his desire to share his love of the sea. He's serious enough about it that he works actively with local marine educational facilities and takes childrens' groups out 15 to 20 times a year with a marine biologist on board, as part of his floating marine educational program, Sea Star Ocean Lab. He's also taken single families out for the same type of trip, part of a trend toward small eco-adventures in the middle of family beach vacations. "Rather than a day at Disneyland or Sea World they’d rather come out with us," he says. 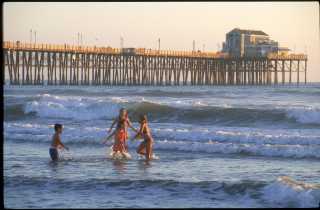 Come back soon to our Oceanside section soon: We'll be adding more dining, activities and accommodation news. Oceanside photos courtesy of California Welcome Center Oceanside. Dana Point Harbor photo courtesy of Lynn Kelly. Return from the Ocean Fishing page to the home page.